06.50. The rain has been continuous all night, earlier the drops were sporadic, tapping against the windows like fingers, now however these fingers have become fists that beat against the glass like some beast seeking salvation from the deluge. The guttering bravely attempts to deal with the torrent and spills it’s cargo nosily as it rushes down to earth. We suddenly realise that the rain has managed to find its way into the bedroom, and pools of water sit upon the tiled floor. (Thank goodness we’re not back in the UK with our carpeted bedrooms). It looks like the main entry point is beneath the balcony doors; I look out and the rain is coming down at an unusual angle, more horizontal than vertical. The main body of water is easily brushed back out through the doors and over the edge of the balcony, sloshing upon the tarpaulin covering a parked piaggio. There’s a small river that has travelled from under the window frame, there’s no obvious entry point and the wall remains dry, this trickle of water has flowed around the room, clinging to the walls until it has come to rest under the bed. We move the bed and place old newspapers down to soak up the excess, before retiring downstairs for a welcome cup of tea. 08.15. The day is hushed, no birds can be heard, and even the workmen in the valley who have been noisy in the endeavours all week are silent, the rain putting an end to their toil. The only sound being the chug chug of water spilling out of drainpipes, creating rivers that meander through the streets. The downpour has now dissipated and we have that fine veil of rain that clings to everything, soaking into the surrounding houses like thin soup into a crouton, turning the ochre coloured bricks brown. The exposed side of the house has borne the brunt of the storm, its stucco in places changed from a pale grey to a malevolent black. As water boils upon the stove for another cup of tea, Morrissey laments in the kitchen about how we hate it when our friends become successful. The breakfast dishes are cleared away to the Spear of Destiny’s, ‘Never take Me Alive’ as the sun begins to show its face. Several solitary fat raindrops fall down the chimney plopping lazily into the empty fireplace. I pack the suitcase in readiness for tomorrows departure, making sure my 5 litres of ‘Fonte Monache’ extra virgin olive oil is sandwiched between jeans, socks and shirts; packaged safely to withstand both Ciampino and East Midlands package handlers. We spend an hour taking a drive to the coast, a completely pointless exercise on such a miserable day; a gloomy coastline does nothing to stir the spirit. On the way back we stop off at a supermarket where I buy a vac-pack of fat green Italian olives, and contemplate purchasing a t-shirt with the logo ‘BAZ’ emblazoned across the chest; I decide not to bother. Back home, within seconds the olives are ripped open and several disappear with relish. A homemade mushroom soup simmers on the hob; Ida Maria finishes singing ‘Morning Light’, making way for Stevie Nicks to ask us to stop draggin’ her heart around. Lunch is the soup with chunks of bread and slices of mortadella and the delicious fat olives. I’ve made far too much soup for just two people, but today who cares about excess, as the rain continues outside the soup inside is good for the soul? Echo and the Bunnymen perpetuate the sombre mood with 'No Dark Things'; I think it may be time for a walk, perhaps a trip to the cemetery will liven things up? 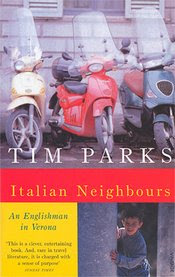 Deciding against a walk I spend the afternoon reading, Italian Neighbours by Tim Park, I find it amusing and at times informative but sadly in some parts quite dated. Dinner over, we double check everything is as it should be, the rain has come in under the balcony door again, nothing too serious and it’s easily dealt with. I block the gap with a large yellow towel, hoping that Helen wont mind when she finds it; still I’m sure a smelly towel is better than a wet bedroom. As we have an early start tomorrow, I put our suitcase in the back of the car, meaning one less task in the early hours. I walk back to the house and I can hear the melodious tones of Toyah as ‘Out Of The Blue’ from the Dreamland album, (re-issued as The Phoenix) drifts out into the evening, floating through the piazza like a whisper, I smile knowing this is how I will remember leaving Ari. With just the recycling to sort out the Montepulciano is cracked open.